Cuba has produced an interesting case of “exceptionalism” because this socialist and communist regime has been able to maintain power for more than fifty years merely ninety miles away from the home of democracy— the United States (Hoffman and Whitehead 2006, 5). This poses a dilemma because despite all the external pressures that have tried to dissolve the regime, mainly the U.S. embargo, the Castro brothers continue to remain in power. This question has become more relevant in recent years because as the “biological clock” continues to tick for this older generation, there has been much speculation about the possibility of change (Erikson 2009). However, it seems that the key to deciphering the process that Cuba might undergo in the future rests in understanding the exceptional nature of the Cuban regime. For this reason, this essay aims to explore how the Castro regime has remained in power for such a long period of time given all the factors that have challenged its survival. Answering this question will provide the necessary framework for understanding how the regime might behave when its survival is at stake, especially as Fidel and Raúl Castro begin to disappear from the political arena. One possible explanation that could account for the exceptional nature of the Cuban regime is the use of fragmentation as a weapon for consolidating power and surviving politically. This idea of fragmentation refers to fractures or divisions within Cuban society, which are not only manifested through the exiled Cuban-American community, but also within Cuba itself. Even though social fragmentation is evident in other countries and societies, the case of Cuban fragmentation is arguably unique because it is the product of a regime’s craving for political control. Therefore, this discussion will focus on two time periods of Cuban history when the regime cautiously fragmented the Cuban society in order to consolidate and retain its political authority—the time after the triumph of the Revolution (1960s) and the fall of the Soviet Union (1990s). The first part of this discussion analyzes the crucial years of the 1960s, which mark the beginning of Fidel’s rise to power along with his 26th of July Movement. This time period is important because one observes how Fidel Castro, a revolutionary leader descending from the mountains of Sierra Maestra, was able to consolidate his political authority. During the 1960s, Fidel Castro undertakes a radical socialist path that allows him to eliminate the opposition, while at the same time build the pillars of his regime—overwhelming state control and the fight against the United States. As this discussion will demonstrate, the underlying characteristics of Fidel Castro’s policies during this time are its fragmenting and marginalizing nature. The second part of this discussion looks at the fragmenting nature of Fidel Castro’s policies during the economic reforms that were implemented after the fall of the Soviet Union, when the survival of the regime was seriously threatened. Instead of fragmenting the Cuban social classes in order to eliminate the opposition that could result from Cuba’s elite; this time, however, Fidel chooses to fragment the Cuban economy. The fragmentation occurs in such a way that only Fidel’s political coalition experiences the benefits of the economic reforms, while the rest of the Cuban population continues to endure increasing economic hardships. Fidel Castro and his 26th of July Movement took over Cuba’s streets in January 1959. Even though Fidel was an extremely charismatic leader, he emerged from a Cuban political context that was marked by instability and violence. In fact, Fidel’s acclaimed triumph was nothing more than an armed overthrow of the previous Cuban president, Fulgencio Batista. By the most generous accounts Batista was deemed a merciless dictator who heavily oppressed and exterminated most of the urban revolutionary opposition (Luque Escalona 2003, 14). The overthrow of the Batista regime was by no means the sole product of Fidel’s actions since he had been mostly in the mountains while a crucial part of revolutionary fight took place in the streets of Havana. However, whether a product of luck or extreme caution, Fidel was one of the few leaders of the revolutionary resistance alive since other leaders like José Antonio Echeverria and Frank País had already been killed (Luque Escalona 2003, 21). Despite that other leaders had fought until their death to overthrow Batista, Fidel’s charismatic and vibrant personality quickly won the hearts of the Cuban people. Fidel’s legendary characteristics and revolutionary spirit gave the Cuban people a sense of hope for a brighter future or as he would call it, a new order. With an astonishing popular support, Fidel’s next logical step was to consolidate his political power. In order to accomplish his goal, Fidel knew that the remainder of the revolutionary groups that were involved in the fight against Batista had to be quickly eliminated, so that they would not challenge his political ambitions or Fidelismo (Szulc 2003, 88). As a result, Fidel developed a radical strategy of political polarization that rested on a powerful socialist ideology that fragmented the Cuban society. Not only were the Batistianos or government officials from the previous regime marginalized and prosecuted, but Fidel’s own revolutionary compatriots were instantly imprisoned and assassinated given that they showed minimal signs of disagreement with the path the revolution was taking. How Castro was able to consolidate his power is an interesting and challenging question. It appears that Fidel knew that in order to consolidate his newly acquired political power he had to take advantage of the factors that catalyzed his rise to power—his appeal to a strong socialist ideology and moral values. Through the decision to confiscate private property and promote the redistribution of land, Fidel created an enormous rapture in Cuban society since his views immediately fragmented those who were in the upper echelons of Cuban society and had different political views and economic interests. Fidel’s radical attitude commenced with the confiscation of property of those who were part of the previous regime. As Louis Pérez Jr., the dean of research historians on Cuba, recalls, “Property owned by batistianos was confiscated, their safe deposit boxes seized, and their bank accounts frozen” (1988, 315). Although one might argue that Fidel’s actions were justified because this was an appropriate method for punishing those who belonged to the Batista regime, it appears that Fidel had something else in mind. For instance, “In the first nine months of 1959, an estimated 1500 decrees, laws, and edicts were enacted” (Pérez 1988, 320). The nature of this powerful government initiative was simple: it was Fidel’s form of responding and satisfying what Marifeli Pérez-Stable (1993) calls clases populares or the working class, which were the central support and target group of Fidel’s Revolution. This led to the “most sweeping measure enacted by the first year,” which was the creation of the Agrarian Reform Law of 1959 (Pérez 1988, 322). As Pérez describes, the terms of the new law were that “all real estate holdings were restricted in size” and the land that exceeded the limits established by the government was “nationalized” (1988, 320). Indeed, as Fidel might have suspected, these early reforms measures instantly won popular support for the revolutionary government. However, this radical nature of the revolution to redistribute property rapidly fragmented the Cuban society because those who were outside the scope of the working class saw themselves alienated and without a voice to express their concerns (Pérez-Stable 1993, 45). Cuban society had always been divided, but perhaps the difference now with Fidel’s radical reforms is that there was no way to express dissent. At this time in Cuban history any form of dissent meant opposition to the Revolution—meaning dissenters were in favor of the old order and opposed the moral values of honest governing and equality that Fidel was trying to institute. Dissent was not seen as a form of expression, but as a direct threat to the Revolution and the person’s allegiance was severely questioned. Therefore, during this period the revolutionary slogan, ¿Estás con Fidel? meaning Are you with Fidel? was used to identify and separate those who disagreed with Fidel’s policies or as he often liked to call them—gusanos—worms. This sense of dissatisfaction and fragmentation was further catalyzed when the Cuban regime began to expropriate American properties on the island. For instance, Pérez recounts that “on August 5 Cuba expropriated additional North American properties on the island, including two utilities, 36 sugar mills, and petroleum assets” (1988, 326). The confiscation of American property had a devastating effect on the Cuban economy because many employees of North American enterprises including managers, accountants, and attorneys immediately suffered a “decline of their standard of living, for Cubans in the employ of foreigners had traditionally enjoyed higher salaries” (Pérez 1988, 329). The nationalization of foreign and domestic property alike served to consolidate the power of the regime for three reasons: (1) it gave the government an expanded role in the economy, (2) infuriated the United States, and (3) externalized dissent. The nationalization of the Cuban economy “transformed the state into employer and landlord” (Pérez 1988, 329). Inevitably, this increased the power of the government because now the state was the sole player in a sphere that affected most Cubans—working and housing conditions. With the government as the sole employer and landlord, Cubans had no option, but to interact with the government and the state had an extraordinary opportunity to expand its reach and control. For instance, this increased government control is evident through the emergence of mass organizations like the Committees for the Defense of the Revolution (CDRs), the Federation of Cuban Women (FMC), the Association of Young Rebels (AJR), and the National Organization of Small Peasants (ANAP). This was a crucial move for the Cuban regime because it consolidated its power by fostering a close relationship between the state and the people at a time when it needed it the most—its early years. The expansion of the state is the clearest sign that through Fidel’s radical reforms, the Cuban regime was able to assume a greater role not just in the managing of the country, but in the daily lives of all Cubans. Also, the nationalization of American property eventually led to the rupture of Cuban-American relations, which was manifested through the economic embargo of American products implemented by the Eisenhower administration in October of 1960. This confrontation with the United States allowed Fidel to reap the benefits of a nationalist fervor. In other words, Fidel was doing what no other Cuban leader had done in the past, which was to challenge and confront the United States. As Pérez states, “Defense of the nation became indistinguishable from defense of the revolution, and in fact, at once accelerated and facilitated the centralization of power, curtailment of civil liberties, and elimination of opposition, all in the name of national security” (1988, 325). This demonstrates that the confiscation of private property which was the product of Fidel’s radical socialist reforms upon his ascension to power, eventually allowed him to create the appropriate political atmosphere for him to maximize on the growing new sense of nationalism among the Cuban people. Fidel’s gamble that the fight against the United States would help him consolidate his regime becomes more evident through the failed invasion of the Bay of Pigs of 1961. This failed attempt to invade the island by Cuban American exiles under President John F. Kennedy’s administration allowed the regime in the first couple of years of its existence to quickly identify the United States as a threatening force. For instance, Tad Szulc explains that “America- baiting was the key element of Castro’s strategy […] he foresaw that his regime would gain at home and in the eyes of much of the world if the Eisenhower administration (and later president Kennedy) reacted with hostility to his actions and rhetoric; the Yankees would be the bullies” (2003, 91). If this observation is indeed correct, it means that Fidel’s policies of confiscating private American property was not just an unintended consequence, but rather the product of a deliberate well thought political project. From that moment forward Fidel consolidated his political power because he was able to demonstrate to the Cuban people that he could resist an invasion attempt by the giant bully to the North, the United States. Moreover, during the 1960s the effect of Fidel’s radical reforms resulted in the practice of “externalizing dissent.” Fidel’s newly created policies and radical nature of his socialist ideology left no alternatives for liberals to disagree with the revolutionary government since any form of dissent was deemed as an action against the revolution. For instance, Pérez notes that “By the end of April an estimated 100,000 persons were imprisoned or otherwise detained,” thus “virtually no suspected opponent of the revolution remained free in Cuba after that time” (1988, 331). The powerful ideological divide created by Fidel’s radical nature forced many to find exile in a foreign, yet close land—the United States. As a result, “The flight of the opposition served to strengthen the revolutionary consensus within the island, thereby contributing in another fashion to the further consolidation of the government” (Pérez 1988, 336). Similarly, Jorge Domínguez in his article “Why the Cuban Regime has Not Fallen” states: “At times, the government has promoted the emigration of dissidents, knowing that they can do less harm from abroad than in Cuba,” thus “emigration has always served to consolidate this regime” (2003, 438). With the majority of the Cuban upper middle class and the elites, who posed the most threat to Fidel’s regime outside of the island, Fidel’s claim to power remained virtually unchallenged. The Cuban upper class left with the hope that the U.S. would intervene and everything would return to normal, but that dream never materialized. Another instance when the Castro regime has deliberately used fragmentation as a weapon to survive politically was during the economic crisis of the 1990s, which was precipitated by the fall of the Soviet Union in 1989. Cuba was severely affected by the fall of the Soviet Union due to the tremendous influence that Soviet bloc countries had on the Cuban economy. International economist Jorge Pérez-López in his article, “Waiting for Godot: Cuba’s Stalled Reforms and Continued Economic Crisis,” explains that “the Soviet bloc countries were the primary markets for Cuba’s exports of sugar, nickel, citrus, alcoholic beverages and tobacco products […] and they were also Cuba’s main source of food, raw materials, fuel, machinery, and transportation equipment” (2003, 177). This dependence of Cuba on Soviet aid is most evident in the fact that Soviet bloc countries “extended extraordinarily beneficial trading terms to Cuba, purchasing sugar at prices that far exceeded world market prices and selling oil at below-world market prices and allowing Cuba to re-export the oil to earn hard currency” (2003, 178). 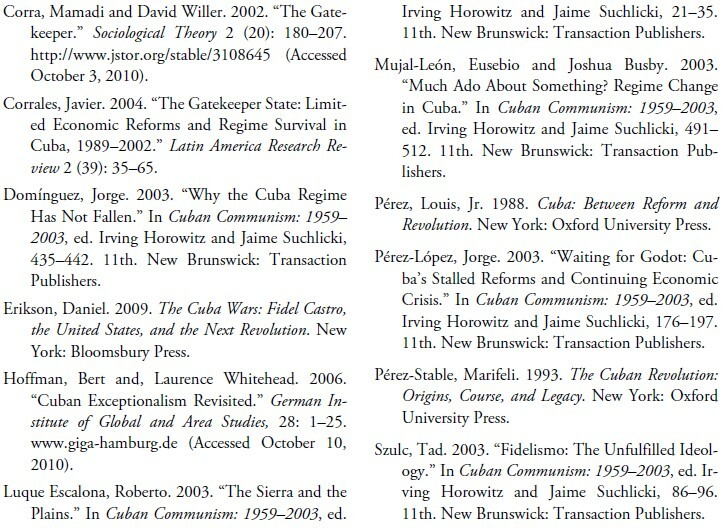 No wonder, the collapse of the Soviet Union meant that from the years of 1989 to 1993 “Cuba’s real GDP dropped nearly 35 percent, a contraction in national income second only to that experienced during the Great Depression,” as Eusebio Mujal-Leon and Joshua Busby describe in their article “Much Ado About Something? Regime Change in Cuba” (2003, 497). The practical translation of these figures is that the Cuban government was in serious economic trouble in the beginning of the 1990s. This economic crisis forced Fidel Castro to declare an “economic austerity program aimed at ‘resisting’ change and maintaining power,” called the Período Especial en Tiempo de Paz or Special Period in Time of Peace (Pérez-López 2003, 180). During this severe economic crisis, the standard of living of the population in Cuba was severely affected. For instance, Pérez-López describes that the rationing of consumer goods was “reinstated and expanded,” a schedule of “rotating blackouts” was instituted throughout the island, and public transportation “deteriorated severely” (2003, 181). The severity of this economic crisis threatened the survival of Castro’s regime because an increase in economic difficulties might have tempted the political ambitions of some of the government’s elite to break from Fidel’s political coalition and do things differently. In response to this severe economic crisis, where the survival of the regime was severely threatened, “the Cuban leadership instituted a handful of economic reform measures” (Pérez-López 2003, 186). As Pérez- López explains, the “first economic reform undertaken by the Cuban government in the summer of 1993 was to decriminalize the holding and hard currency by Cuban citizens” (2003, 183). Also, in September 1993, “the Cuban government authorized self employment in more than a 100 occupations, primarily in the transportation, home repair, and personal services sector” (Pérez-López 2003, 184). Subsequently, in the following years of 1994 and 1995, Cuba authorized the creation of agricultural markets, opened new sectors to direct foreign investment, and created export processing zones. These reforms, however, were far from being a “comprehensive blueprint” to reform the Cuban economy (Pérez-López 2003, 187). On the contrary, Pérez-López classifies the Cuban reforms as “modest, opportunistic steps from the government and the Communist Party to cope with the economic crisis and still remain in power” (2003, 187). The reason why Pérez-López believes that these economic reforms were a survival strategy is because Cuba only began to “implement economic reforms until the summer of 1993, when the economic crisis threatened the regime survival” (2003, 187). These economic reforms had a fragmenting effect because the restrictive nature of the reforms did not permit enough change to vastly improve the economic situation of the Cuban population, but only served to alleviate some of the economic pressure on the regime’s governing elite. The unevenness and restrictive nature of the reforms were able to eliminate the threat created by the economic crisis because the reforms only brought benefits to the political elite and not the general population. For instance, the restrictive nature of these reforms can be seen in the fact that even though the new reforms authorized self employment, “professionals holding a university degree could not become self employed” (Pérez-López 2003, 184). As Pérez-López recounts, this meant that “physicians, dentists, teachers, professors, and researchers were excluded from self-employment altogether” (2003, 185). This demonstrates that even when the Cuban government tried to somehow allow the private sector to flourish; it was not willing to release its monopoly on important and vital sectors of the economy like health services. Even when in July 1995, the “Ministry of Labor authorized university graduates to become self-employed,” they had to be employed in occupations that differed from their professional training (Pérez-López 2003, 185). This meant that a professional engineer or doctor could only work as a “taxi driver” or in some other similarly minor occupation (Pérez-López 2003, 185). Obviously, this contradictory economic policy simply created the illusion of freedom of self-employment, but was incapable of improving the overall Cuban economy and generating true economic growth. Furthermore, this same level of unevenness and restrictiveness in the economic policies implemented by the regime during the crises of the 1990s can be seen through the legalization of the U.S. dollar and opening of new sectors for direct foreign investment. In response, Domínguez offers the following criticism of the liberalization of the U.S. dollar: “Cuban workers cannot be paid in dollars, limiting thereby some of the potentially stimulative impact of the decision to legalize the commercial use of dollars” (2003, 439). The limits on the commercial use of dollars are further enhanced by the government’s efforts to “create a new currency, the convertible peso, to gradually replace the US dollar and other foreign currencies on the island” (Pérez-López 2003, 183). This demonstrates that the government’s reforms to survive the economic crisis were narrowly crafted in such a way that they impeded Fidel from losing any political power. These reforms were narrowly crafted to only benefit those in the upper echelons of the Cuban government. The legalization of the dollar permitted an influx of remittances from abroad, which provided the much needed hard currency for the regime; yet the Cuban workers saw no difference in their pay checks because they were still being paid in Cuban pesos. Indeed, one can even argue that the policy to legalize the dollar created an even worst situation for Cubans because the legalization of the dollar was followed by the creation of government stores that only accept dollars or convertible pesos in order for the state to channel and retain the much needed hard currency. This dual currency system is a significant problem for most Cubans because the state only pays Cuban workers in pesos, yet access to products can only be obtained through the government stores, which only accept dollars or convertible pesos. How the Cuban regime was able to manage the relative success generated by its restrictive opening to foreign direct investment reveals the unique nature of the reforms. The success of Fidel’s economic reforms in the early 1990s rests primarily in the fact that through the restrictiveness and unevenness of the reforms he did not allow the benefits generated by the reforms to reach the general Cuban population. If that would have happened, it might have forced Fidel into a position where he had to bargain with a larger political coalition, which inevitably would have transferred into a loosening of his monopoly on political power. In essence, the key to the success of the economic reforms of the 1990s was that they kept the winning coalition of the duros, the political hardliners, relatively limited and satisfied. Therefore, the Cuban regime, as the result of its strategy of fragmenting the Cuban economy in the form of establishing limited foreign direct investment sectors has become what Javier Corrales calls the “gatekeeper state” (2004, 36). This idea of the “gatekeeper is defined by Mamadi Corra and David Willer as controlling “access to ‘benefits’ valued by others who are their ‘clients’” (2002, 180). Applied to the Cuban context, the “benefits” that these authors are referring to are those generated by the economic reforms and the “clients” are those whom the regime deems vital to its survival, the duros. Therefore, Corrales believes that the economic reforms that the Cuban regime implemented during the economic crisis of the 1990s, not only permitted the government to retain its political power, but to enhance it. For instance, Corrales states: “In Cuba, limited reforms actually enhanced the power of the state by converting it into the gatekeeper state of a new and highly valuable commodity: the small and profitable external sector” (2004, 36). This newly found commodity that Corrales refers to can be seen as the “benefit” that Corra and Willer identify in their definition of what it means to be a gatekeeper. As Corrales notes, “this benefit in the case of Cuba is the profitable external sector that emerged as a result of the government’s opening to direct foreign investment” (2004, 40). It is important to notice that a key part of this “benefit” is its diminutive size. Access to the external sector cannot be too large because that would pose a direct threat to the political survival of the regime because of the economic access that it would give to the general population. However, the Castro regime has ensured that this benefit remains small enough through the unevenness of the economic reforms, thus leading Corrales to believe that “uneven economic reforms magnified the power of the state by enhancing its capacity to dispense inducements and constraints” (2004, 36). In fact, it is precisely due to this ability to limit the size of the benefits generated by the reforms that Fidel is able to maintain the winning coalition of the duros in his regime satisfied. In Cuba, this winning coalition is extremely limited since it mostly includes military officials which constitute the upper echelons of the Cuban Communist Party. Castro has to maintain the external sector moderately diminutive, so that it can only be controlled by these individuals. Gaining access to the benefits of the newly created and successful external sector acts as a reward for the allegiance and support of the winning coalition of the duros. This is precisely what Castro did through the narrow reforms that he implemented as a response to the crisis of the 1990s. By keeping the benefits of the external sector relatively small, Fidel Castro was able to distribute this benefits among his political winning coalition of the duros, without having to surrender any political terrain. As it is evident, in Cuba political power is inseparable from access to economic opportunities. Perhaps, this could explain why even though the economic crisis had a tremendous impact of the economic situation of the general Cuban population, the political winning coalition never experienced what the general population was suffering. The winning coalition never suffered any pressure to break from Fidel Castro’s side because Castro quickly catered to their political needs by giving them economic access to the thriving external sector. Through the behavior of the Cuban regime during this time period, it is evident that fragmentation, once again, was the sole intention of the government. This time, however, the Castro government had to employ its capacity of fragmenting the Cuban economy in order to survive politically. Castro had to close the gates to the majority of the Cuban population, in order to ensure that his political coalition of the duros were the only beneficiaries of the economic rewards created by the opening to direct foreign investment. In other words, Castro’s actions fragmented the Cuban economy in two parts: those who have access to this small thriving economic sector and those who do not. The result was that Castro and his political coalition were able to remain in power and survive the economic crisis after the fall of the Soviet Union, while the majority of the Cuban people remained in an extremely difficult economic situation. However, it seems rather perplexing that if the majority of the Cuban population remained in severe economic hardships they did not challenge the government or the status quo. The answer to this interesting dilemma can be found in Domínguez’s narration of his conversation with a Cuban priest where Domínguez asks the priest about the life of his parishioners. According to Domínguez, the priest explained: “Times are tough […] the typical parishioner is a worker with a family who has to get up at 5 AM, sometimes earlier to get in line to secure food for breakfast for the youngsters and the elderly” (2003, 435). The priest continues describing the difficulties that Cubans endure to get to work due to the lack of transportation and concludes by saying, “Well, my friend, at 10 PM the last thought that these working men and women can have is to get out on a bicycle once again to attend a political meeting” (2003, 435). This demonstrates what Domínguez later emphasizes at the end of the conversation, which is that for Cubans political participation has become a “leisure activity,” thus no longer possible as a result of the difficult economic situation (2003, 437). This makes it easier to understand why the Castro’s regime used fragmentation of the Cuban economy in order to maintain its political control. Castro knew that the greatest threat to his authority could only come from his own political winning coalition; therefore he opted to implement policies that only benefited this small and selective group. This could explain why Castro permitted the opening of direct foreign investment and the creation of the external sector, yet was unwilling to permit the privatization of the Cuban economy through the success of the self-employed. As it is evident from the previous conversation of Domínguez with the Cuban priest, the economic hardships that Cubans endure have placed the government in a relatively secure position because the Castro government knows that without food on the table Cubans cannot possibly fathom the idea of worrying about politics. All that matters for Cubans is surviving one more day—a day with the scarcity of running water, electricity, or food. If this analysis is correct, it seems that Fidel Castro and his regime have repeatedly fragmented the Cuban society in order to consolidate and retain political control. This means that the following two conclusions can be drawn. First, Fidel with his strong radical commitment to a socialist and morally superior agenda ideologically divided those who had a different political vision of Cuba. This division occurred immediately after Fidel assumed power in the early years of the 1960s. Second, at a time when the survival of the Cuban regime was severely threatened by the fall of the Soviet Union in 1989, Fidel opted to fragment the Cuban society once again. However, the difference is that this time the fragmentation took place in the economic arena. Fidel’s response to the economic crisis only included reforms that were intrinsically divisive of the Cuban population. In essence, this discussion reveals the true nature of Fidel Castro and his political affiliates—maintaining and exercising political control. Through its use of fragmentation as a political weapon, this regime has demonstrated that it is willing to do whatever it takes in order to maintain its political monopoly, even if it means forcing the Cuban population to live in exile or in miserable economic conditions. 1. Editor’s Note: This essay was awarded Third Prize in the ASCE 2011 Student Prize Competition for undergraduate students. 2. Special thanks to Professor Eusebio Mujal-León and Manela Diez from Georgetown University, whose help, guidance, and support was immeasurable during all the stages of this research paper. Jose Vazquez was born in La Habana and migrated to the United States at the age of eleven. He is a senior at Georgetown University, pursuing studies in government and planning on attending law school. Prior to Georgetown University, he attended MiamiDade Honors College, where he earned an Associates in Arts degree. He is an active member in the Georgetown Cuban American Student Association and Roots of Hope/Raices de Esperanza.